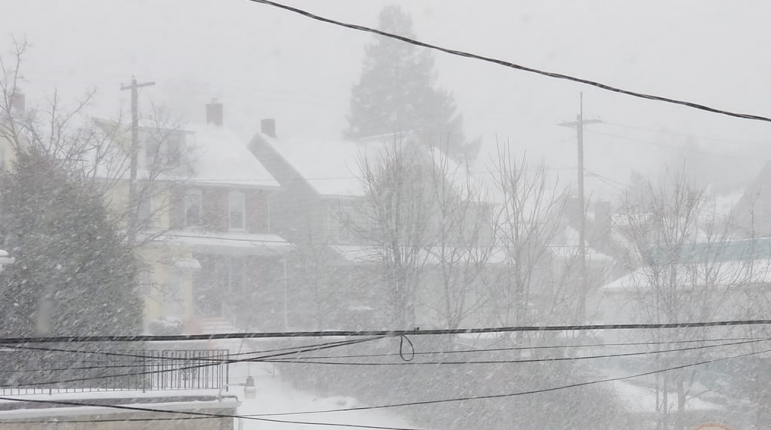 The 1100 block of Broadway in Fountain Hill borough is barely visible during a heavy snow squall Wednesday afternoon. The brief snow squall was followed by an invasion of cold Arctic air. In the wake of Tuesday’s snowstorm, winter continued its assault of Saucon Valley Wednesday, with a one-two punch of severe weather. The day dawned clear, but conditions rapidly deteriorated in the early afternoon, with a snow squall that briefly produced whiteout conditions and caused accidents on many area roads. The National Weather Service issued a snow squall warning for eastern Lehigh County and southwestern Northampton County because of the dangerous travel conditions the squall produced, noting that visibility was zero in places because of blowing snow. Behind the Arctic front that produced the squall residents are noticing a big drop in temperatures as well as gusty winds that are producing wind chills as low as -20 degrees. As of 4 p.m. the temperature at Lehigh Valley International Airport had fallen to 15 degrees, and the wind chill was -3, with winds gusting 31 mph. The National Weather Service has issued a wind chill advisory for the area for 7 p.m. Wednesday through 10 a.m. Thursday, when it says the bitter wind chills could cause frostbite on exposed skin in as little as 30 minutes. Tonight’s low temperature is expected to drop below zero, and Thursday’s high will only be in the teens, according to the current weather forecast. A wind advisory is also in effect for the area through 10 p.m. Wednesday, for winds that could gust 40 to 50 mph, according to the NWS. As of 4 p.m. only isolated power outages were being reported, according to PPL’s Outage Center map. Saucon Valley schools were closed for the second day in a row Wednesday, and the weather could affect the opening of schools on Thursday. If you must venture outside, be sure to take precautions against the cold. Never use a gas stove, charcoal grill or outdoor lantern inside your home, as it could lead to a buildup of deadly carbon monoxide gas. Never leave a heating appliance, such as a space heater, unattended. Do not use space heaters while you are sleeping. Never fold an electric blanket while in use. Doing so can damage the wires inside the blanket, which can cause it to spark or overheat. Only use space heaters designed for indoor use and keep them at least 3 feet away from curtains, carpets or furniture. When operating a generator, place it outside your home and far away from any windows, doors and vents. Make sure you keep electronic devices such as cell phones, laptops and tablets fully charged and ready for an emergency. Keep a flashlight, portable radio and extra batteries handy in the event of a power outage. Have bottled water available in case of a power outage as well as a first aid kit, extra blankets, any medications you take and fruit or snacks of some kind that do not spoil without refrigeration. C. Wilmer Johnson, 94, of Upper Saucon Township, died Thursday, April 25, 2019 at St. Luke's Hospital, Quakertown. Mildred P. Benner, 89, of Macungie, and formerly of Durham and Springfield townships, passed away peacefully on April 24, 2019 at home. Mildred was the beloved wife of Kermit R. Benner, with whom she celebrated 70 years of marriage on Dec.
Jane A. Haney, 78, of Freemansburg, died Wednesday, April 24, 2019 at her residence. She was born in Slatington on Sept.